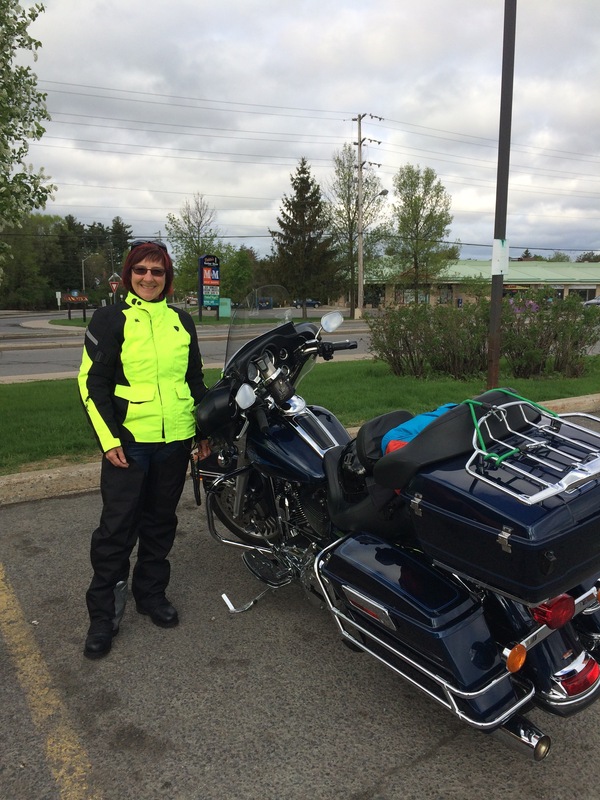 The Big Ride – Those darned rain clouds! As the famous quote from Robert Burns so aptly states “the best laid plans of mice and men often go astray”. Stay tuned. Updates to follow as the rain clouds part! 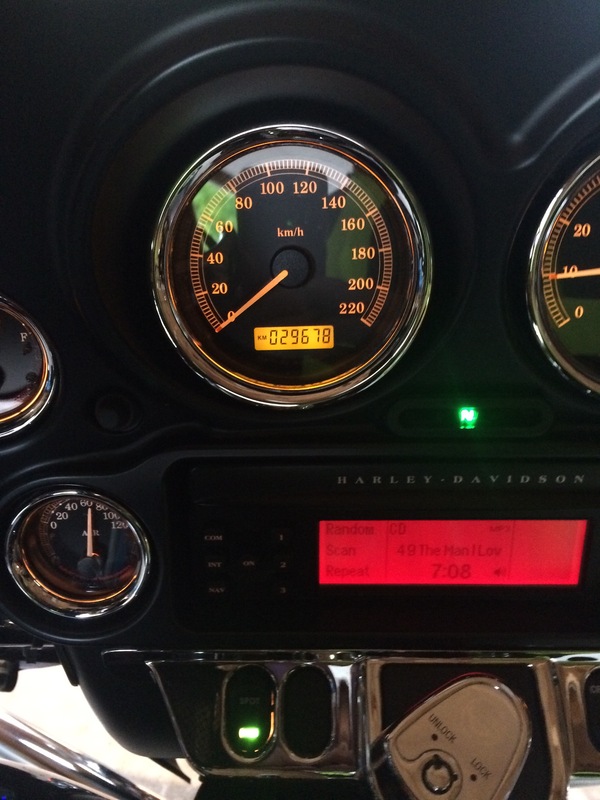 The big day has finally arrived….my bike is warmed up and I’m ready to roll. Wow…what a great first day! 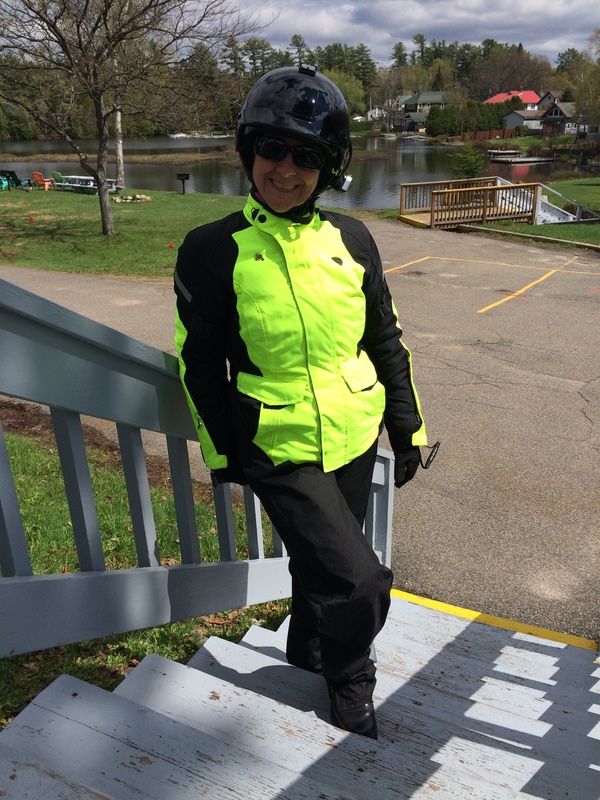 Despite a very chilly start to this morning’s kick off of my epic motorcycle trip to circumnavigate much of North America, today’s ride was dry and very enjoyable, thanks to having electric gear. As I pulled out of the garage this morning the “real feel” according to AccuWeather was a chilly zero degrees! Today I headed south to the Adirondacks, with a first night stay-over in beautiful Lake Placid, New York. If you are in the area be sure to check out the The Adk Restaurant in Keen, a few kilometers south east of Lake Placid. Their menu is full of wonderful choices, all prepared locally, including homemade breads, soups, and more, including many healthy choices. Tomorrow I head south towards Lake George and beyond where the real mountains are. I can hardly wait! Today I experienced what living life is really about. As a personal development and leadership coach I am blessed with being able to help individuals realize their potential and most importantly to live life to its fullest. Being on this trip is allowing me to do just that. Today I experienced it through someone I met along the way. 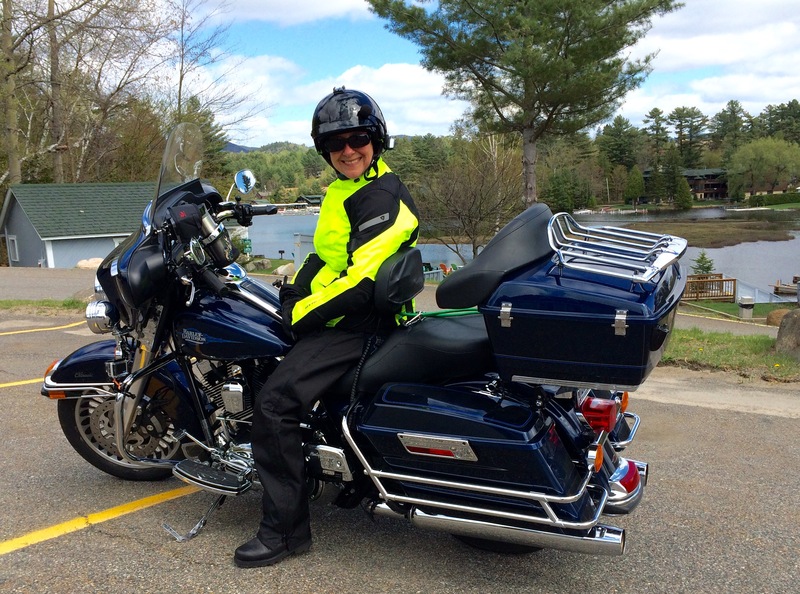 While riding from Lake Placid towards Lake Scanadaga I took Highway 8 which hugged the curves of a series of lakes. I stopped in Hague, NY to take advantage of one of the beautiful lakes that was nestled in behind a park filled with ornamental fruit trees that were in full bloom. 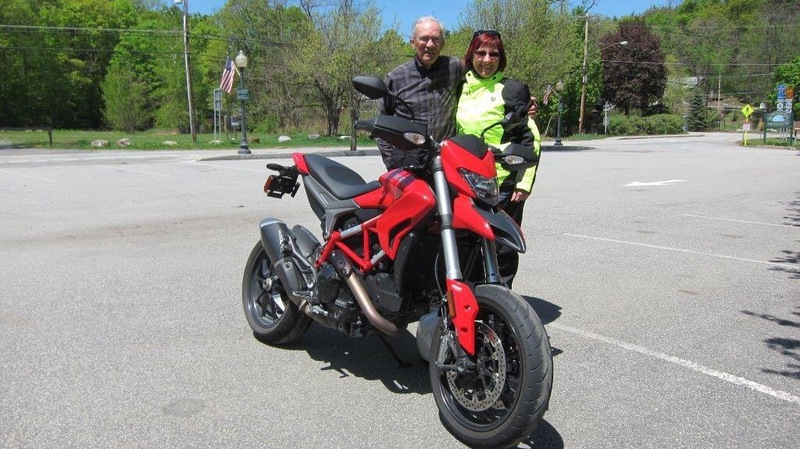 What an inspiration to meet a person who is living his life out loud and continues to enjoy his passion of riding motorcycles at 79 years of age. As I rode away I was filled with a knowing that this is what life is really about. It’s about following our dreams and doing the things that we love most. Thank you Gunther for reaffirming what my heart has been telling me all along. Ride on!! Today was totally over the top. 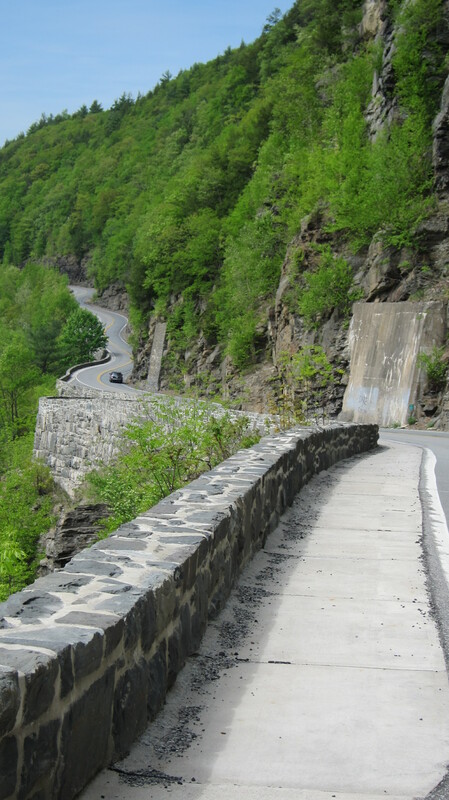 One of the first locations I added to my “bucket list” when I started planning this trip was Hawk’s Nest, New York, on Highway 97 – the Delaware River Scenic Route. When I turned the corner and road snaked before me, it literally took my breath away as I was filled with childlike delight. I must say the experience totally surpassed all of my expectations. The ride was so exhilarating I rode it not once…not twice…but three times because I just couldn’t get enough of it. The one minute video is best viewed on “full screen” mode. Wow! What an amazing trip this is turning out to be! 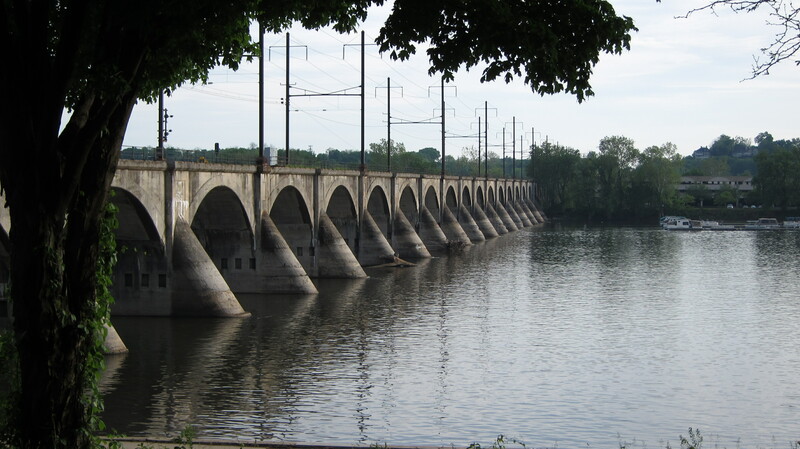 Today’s ride took me through much of Pennsylvania, including the Delaware Water Cap National Recreation Area. The route consisted of sweeping curves through lush forests accompanied with the sweet fragrance of an abundance of wild flowers and shrubs in full bloom. Despite a forecast that suggested rain gear would likely be inevitable, the skies remained clear, with temperatures reaching almost 30 degrees Celsius. Here is a short clip of today’s ride. 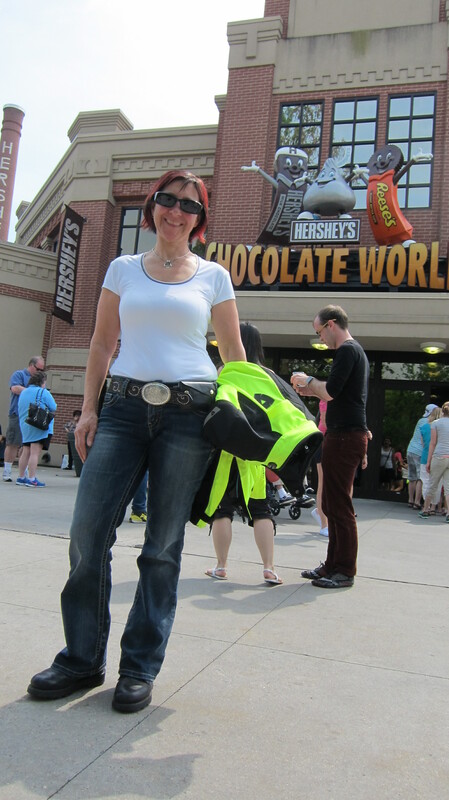 The ride just kept getting sweeter with an unplanned stop at none other than Hershey Pennsylvania to visit Chocolate World! Could it possibly get any sweeter than this? 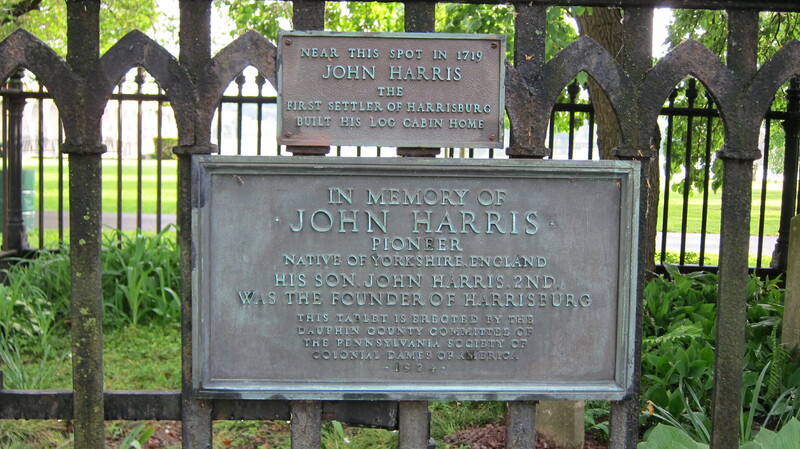 After arriving in Harrisburg late Saturday afternoon on May 16, 2015, I took a pleasant walk along the waterfront which was across the street from my hotel. 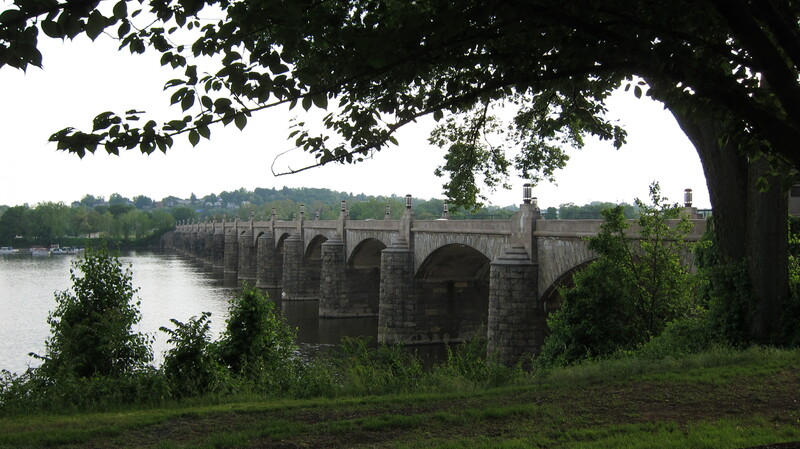 To my delight I found a series of beautiful bridges running across the Susquehanna River. Each of the structures was unique and quite incredible! 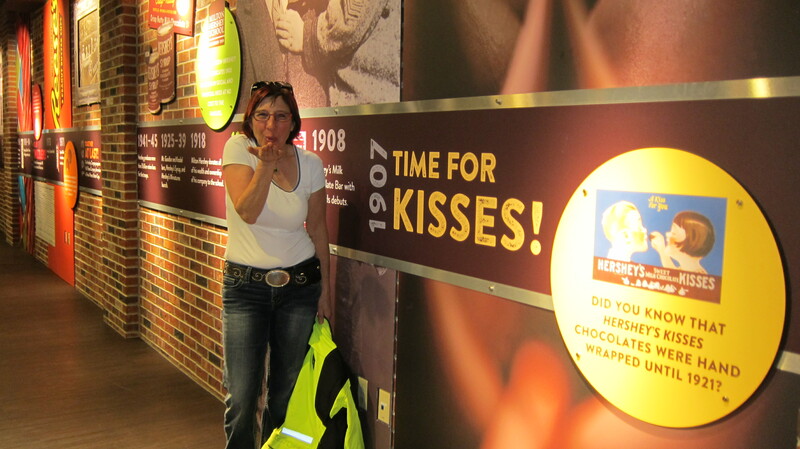 I managed to find myself in York Pennsylvania, where Harley Davidson manufactures motorcycles. Although the plant was closed for the day, I managed to meet a very nice man who works at the HD plant. 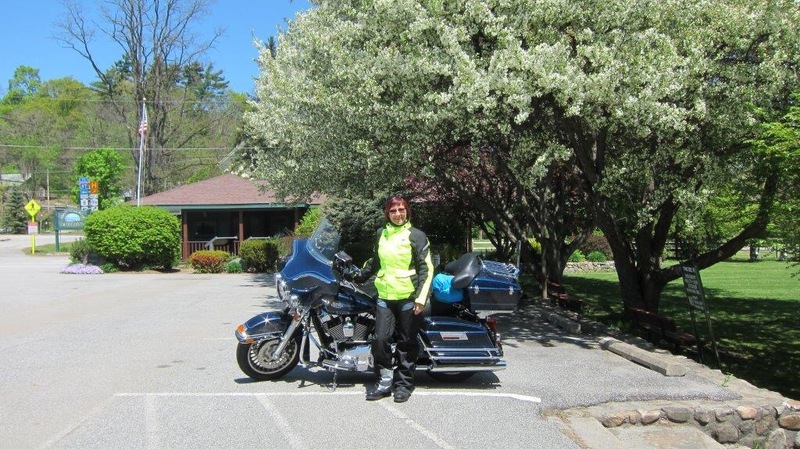 He was kind enough to help me sort out the route and get me back on track by recommending Route 30 which ran through Gettysburg, PA and turned out to be an incredibly enjoyable ride. From there I continued south west and ended up on Highway 219 heading to Elkins, West Virginia. 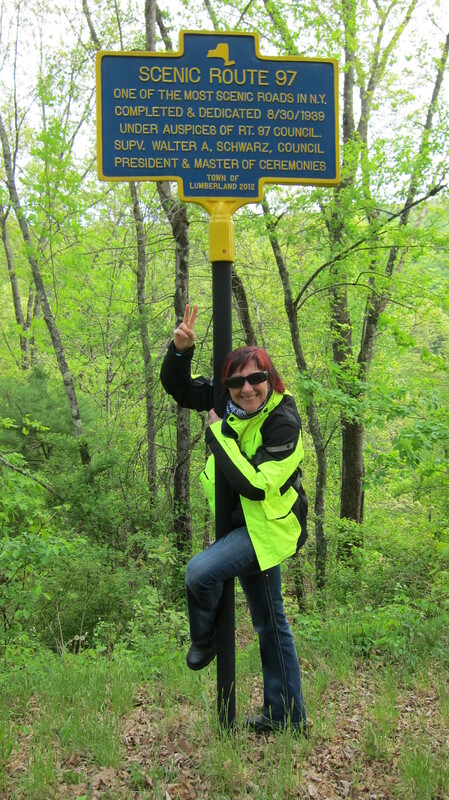 OMG…it was 80 miles (or for my Canadian friends – 130 Kilometers) of the finest road I have ever ridden. I’ve ridden a number of exceptional roads in the past, including the Tail of the Dragon, The Snake and more, but this road was totally exhilarating and far superior to the others. The road consisted of one sweeping curve after another and seemed to go on forever! It ran through farmlands, a state park, as well as a forest preserve. It was well maintained and with very little traffic. Despite initially heading off in the wrong direction this morning, I’m grateful that the Universe had other plans in mind for me today. Today’s experience was an amazing contribution towards the unfolding of my dream! Tomorrow I’m off to discover more awesome roads in West Virginia!